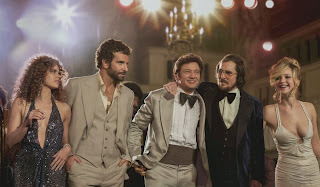 Very loosely based on the FBI ABSCAM operation of the late 70's and early 80's, director's David O. Russell's new film which he wrote with Eric Warren Singer is probably one of the best films of the year. The credits proclaim that “Some of this actually happened”, although one wonders what parts are they talking about because it's so far out there and so much is going on and it's absolutely glorious. Christian Bale is notorious for making physical choices of his characters that are extreme. As Irving Rosenfeld a fictionalized character of the real life con man Melvin Weinberg, he sports a huge gut with a scary comb over toupee held together by glue and hairspray. He may be a schlub, but he makes up for it in confidence and style. He's worked his way up in the world by grifts and scams while being a respectable business man who owns a glass store he inherited from his dad and a string of dry cleaners. He meets the love of life Sydney Prosser (Amy Adams) who used to be a stripper but has big dreams for herself and is not afraid of going after it. She sees a kindred spirit in Irving and is willing to work with him on his latest con which is collecting a fee for setting up loans that never pan out. She creates a character called Edith, a countess from England who has banking connections. They charge $5000 to people who they convince they can get them a 50K loan. They do so well that they get a bigger better office, nice clothes, cars and the attention of FBI agent Richie DiMaso (Bradley Cooper). Richie threatens to bust them unless Irving works for them showing them how to set up a con to catch some bigger fish. The big fish involves the New Jersey mayor of Camden Carmine Polito (Jeremy Renner) who dreams of doing good for his community. He's baited with Arab Sheik who wants to invest in creating a casino gambling mecca. Carmine is reeled in by Irving who knows how to work a mark. Except he's somewhat confused with he begins to develop a real friendship with Carmine who naively believes in Irving. He invites Irving and his wife Rosalyn (Jennifer Lawrence) to dinner. Irving marred Ros and adopted her son who he truly loves. Irving can't seem to say no to the women in his life. That doesn't work well for Edith/Sydney who plays Richie as a plan B in case the job goes south. Richie is getting too involved with the job seeing it as a way to get the Mafia in the net when they come looking to maybe investing too. There's a lot going on in this movie and it's dressed in bad fashion choices from the time period. The women are draped in polyester dresses that leave little to the imagination barely covering their assets. The men are sporting really bad hair with Carmines pompadour and Richie's perms. The east coast accents layer it on with everyone shouting and talking at the same time. Louis C.K. As Richie's FBI boss is notable in his moments trying to reign in his out of control agent by trying to tell him a fishing story anecdote that he never gets to finish. Alessandro Nivola is their big boss who lets Richie run with the con and Robert De Niro as a dangerous mafia leader have small but worthy parts. In fact all the performances are amazing and once more Jennifer Lawrence steals her screen time. It may be sloppy and overlong but you won't feel fleeced.